Ranchi is under siege again. Fresh violence has been reported from city's Doranda area. According to reports, around 8-10 people reached Doranda on Monday night and started firing indiscriminately. The trouble began on Friday at the Manitola area in Doranda after there were rumors that pieces of flesh were found scattered near a place of worship. The rumours spread like wildfire across Ranchi and even to faraway districts like Palamau and Chatra. On Saturday, the city burned during the bandh called by Vishwa Hindu Parishad and Bajrang Dal. There were several attempts by civil society groups as well as the Chief Minister Raghubar Das to bring the city back to the normal. Just as calm seemed to return to the city, the firing at Doranda took place. The city has now become a fortress, with paramilitary forces standing on guard in order to prevent any further outbreak of violence. Two companies of the Rapid Action Force (RAF) were summoned from Bihar's Nawada district after Friday's violence. In addition, 3 CRPF companies, 2 STF companies and 1 SSB company along with hundreds of policemen have been stationed in various parts of the city. However, this heavy deployment has done little to instill confidence among the residents of Ranchi. All the shopping malls and shops on city's main road are deserted. There is little activity in the usually bustling hubs like Birsa Chowk, Argoda Chowk, Kadru, Bahu Bazar, Kachari Chowk. The tension has spread to suburban areas of Kudu and Lohardaga. There is fear that violence may spread to Naxal infested Palamu and Chatra regions as well. In what is being seen as a repeat of the 2002 Gujarat riots, the bandh called by the VHP and Bajrang Dal aggravated tension. Several incidents of firing and arson were reported during the bandh. Several shops and vehicles were gutted by masked activists who paraded the streets brandishing weapons. Butchers and small meat vendors from the minority community were specifically targeted. People were forced to lock themselves indoors in areas like Darji Mohalla. The hooligans didn't even spare the vehicle of the Superintendent of Police. The same pattern was replicated in Lohardaga. In Lawagai village of Lohardaga district, there was a communal flare-up on Saturday following rumours of a place of worship being defiled. Like Ranchi, right-wing outfits carried out a bandh the next day. Similar canards were spread in Satbarwa village in Palamau and Humaganj village in Chatra. The proactive approach of the CM Raghubar Das won praise from all quarters. He flew to Jamshedpur in a helicopter and personally visited the affected areas appeal for calm. "The initiative taken by Raghubar Das is commendable," says S Ali, President of the Jharkhand Students Union. Ali as well as Anjuman Islamia chairman Ibrar Ahmed say that the riots were a "conspiracy by outside elements". Despite his personal efforts, Das will have to answer questions regarding the failure of his administration. 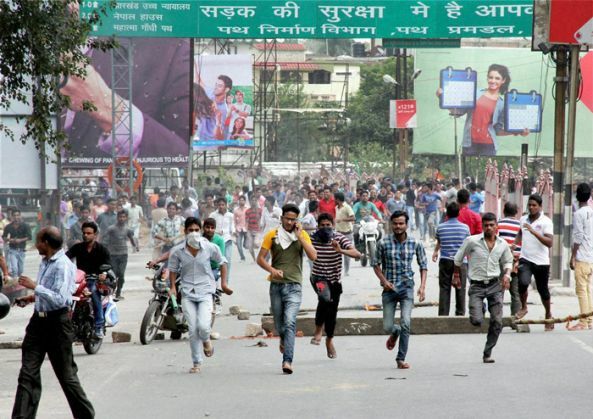 Why did it fail to pre-empt the violence during Saturday's bandh? People in several areas claim that the police did nothing to quell the violence till about 11 am. Police was initially deployed only in Doranda despite clear signals of unrest in other areas. In several areas, the responsibility was left to the traffic police. There was no shortage of police forces in Ranchi. The city has four reserved battalions of the armed police and jaguar police. VHP and its cohorts would not have such a free run had these battalions been put to good use. Who was behind the violence? Police has arrested some members of Durga Pooja Samiti in Doranda but it remains tight-lipped on the investigation. The CM has merely blamed 'unruly' elements for the trouble. Many believe that the violence in Jharkhand will have an impact on the Bihar Assembly elections. Some say that Hindutva outfits have gone on the overdrive as they want to consolidate the votes of the majority. However, police spokesperson SN Pradhan says that there is nothing to suggest the violence was politically motivated. Patna is intricately connected to Ranchi. Dozens of buses ply between the two cities everyday. There are 4 trains that link the two capitals. Hundreds of people from Ranchi work in Patna all week and return home during the weekend. All Ranchi newspapers have pages dedicated to news from Bihar. The VHP's rising influence in Jharkhand is also worth examining. Not too long ago, VHP was one of the most moribund Sangh Parivar outfits in the state. It's state unit struggled to find office bearers for years. Its archaic office, near the sprawling RSS headquarters in Ranchi, didn't even have electricity for months together. The recent spurt in the VHP's activity should be seen in the context of a few key Sangh Parivar events that have been lined up in the near future. First, the Sangh affiliated Vanvasi Kalyan Kendra is gearing for a major meet in October. Second, RSS chief Mohan Bhagwat is slated to come to the state for a long stay. Perhaps the VHP is trying to show its relevance in the run-up to these events. Ranchi, too, has to prepare itself for possible tensions in the near future.Both Durga Puja and Muharram are next month. The threat of communal tensions will be looming, given the large scale at which these festivals are observed.